Not only did the players play with pink stumps , but pink attire was worn on the day as well as the clubhouse being magnificently adorned in pink balloons and streamers. 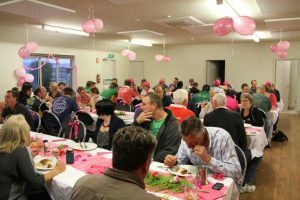 The Old Beach Cricket Club beautifully decorated in pink for the McGrath Foundation Stumps Day. 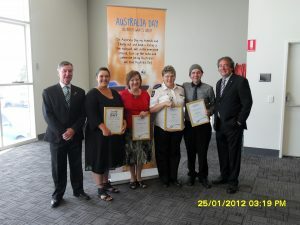 BRIGHTON Council held its annual Volunteers and Australia Day Awards Civic Reception on January 25 with the reception at the Brighton Civic Centre attended by well over 120 invited guests. Mayor Tony Foster addressed those in attendance with his Australia Day message before introducing the Woolworths Australia Day Ambassador. At this time of writing, April 2011 seems a long time ago. We had been advised by the Minister for Immigration and Citizenship Chris Bowen that he was going to develop a temporary detention centre on Defence Department property at the rifle range in Pontville. BRIGHTON’S GP clinic that was forced to close suddenly last year leaving 3000 patients without a doctor, is reopening next month.